A Sinn Féin MLA is calling on would-be voters to tick a controversial part of the new electoral registration forms or else they will be left without a vote in the next election. It’s emerged that thousands of forms have been returned to the Electoral Office without part of the form being filled in. 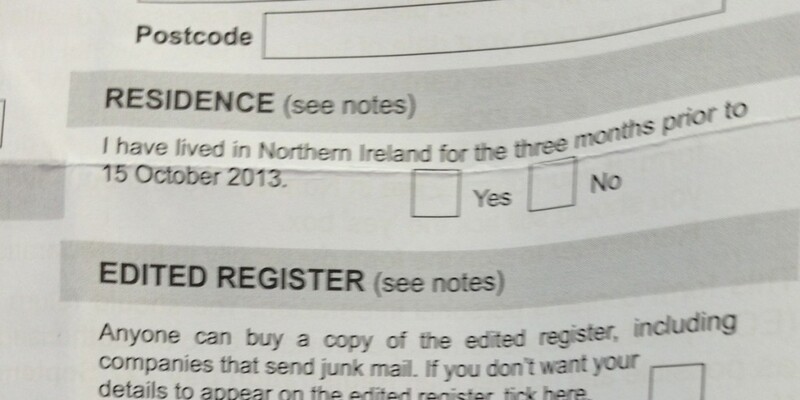 The relevant part of the form it states: ‘I have lived in Northern Ireland for three months prior to October 15 2013’ and asks the person to tick the box as part of the completion exercise. Without the residency box filled in, the form is deemed invalid and returned to the homeowner. It’s believed that the vast majority of those who haven’t ticked the box are nationalists reluctant to use the term ‘Northern Ireland’. The Electoral Office has told the Andersonstown News that the question will not be included on forms from next year on. In the meantime, West Belfast Sinn Féin MLA Rosie McCorley, is urging everyone to tick the box – despite the terminology – ahead of the September 27 deadline. Ms McCorley said: “We would encourage people to tick the Northern Ireland box as we don’t want people to be disenfranchised over not ticking a box,” she said. A spokesperson for the Electoral Office said: “Section 4(2) of the Representation of the People Act 1983 states: The person completing the form must verify that they have been resident in Northern Ireland for the three months prior to the qualifying date of 15 October and we are legally obliged to include this statement in the form.